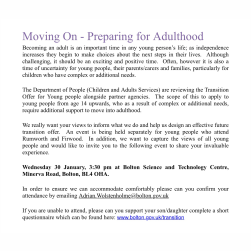 Bolton Council’s Department of People are reviewing the Transition Offer for Young People in Bolton who have additional/complex needs and as a result will need more support as they move into adulthood. The consultation requires views from across the borough from parents, carers, young people and professionals. The transition to adulthood starts when a child is aged 14 and planning for their next steps commences. This includes things like where will they go to college, transitioning to adult social care services and adult health services. Also thinking about skills for employment and independence. Views are needed to inform what Bolton Council do and help them design an effective future transition offer. There is an online questionnaire for young people to complete – this can be done with support if necessary. Pupils who attend Rumworth or Firwood will be having a listening event held during school hours. There is also a listening event for parents and carers and another for young people. Below are the invites from the council that you can read, click on the image to enlarge the document. 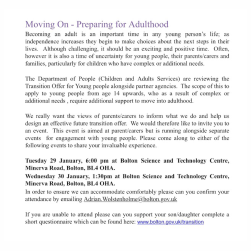 If you, or your young person are planning on attending one of the listening events, please email Adrian.Wolstenholme@bolton.gov.uk to confirm your attendance. All the following will be held at Bolton Science and Technology Centre, Minerva Road, Bolton, BL4 0HA. The building is just on the outskirts of the hospital site, next door to Mount St Joseph. There is free parking on site. Wednesday 30th January from 3.30pm.